Pre-order your own copy of the Tauntaun Riders Unit Expansion at your local retailer or online through our website with free shipping in the continental US today! Forced to the fringes of the galaxy by the relentless pursuit of the Galactic Empire, the Rebel Alliance must establish bases on remote planets far from the gaze of Darth Vader and his feared Death Squadron. Though this might take them to barren worlds like the frigid wastes of Hoth, the Rebels often use their ingenuity to turn these less-than-ideal conditions into an advantage. Using the local fauna to bolster their forces, they can easily traverse a planet’s surface and—in some instances—even use these beasts to fight the Empire. Soon, you can bring one of the most iconic creatures from the Star Wars saga to your epic struggles of the Galactic Civil War. 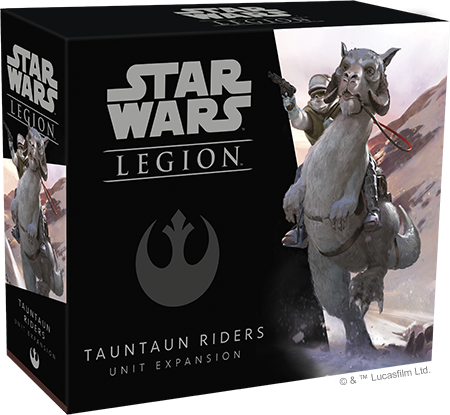 Fantasy Flight Games is excited to announce the Tauntaun Riders Unit Expansion for Star Wars™: Legion! Trained to expertly handle their surefooted mounts across the windswept plains of Hoth, Tauntaun Riders help the Rebellion navigate nearly any environment, scouting Imperial positions and often slowing the enemy’s advance until the rest of the Rebel army can arrive. 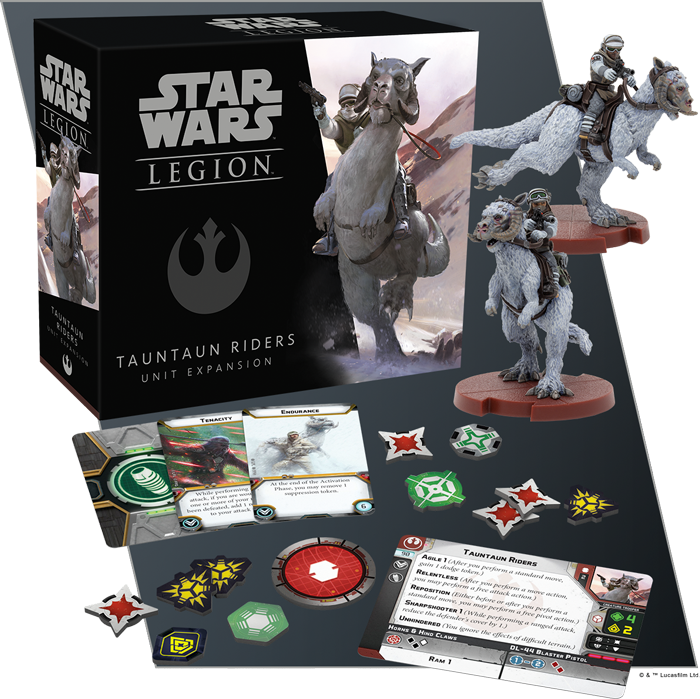 Within this expansion, you’ll find two unique unpainted Tauntaun Rider miniatures, enough for one support unit, along with a new unit card for you to field in battle. Your tauntaun’s natural speed and defense make them useful in a number of situations, of course, and this pack also contains three upgrade cards that give you the freedom to find a role for them that fits your particular battle plan. Wherever they go, members of the Rebel Alliance must remain vigilant if they wish to avoid the Empire. On a frozen planet like Hoth, a tauntaun’s ability to quickly navigate the rough, snow-choked terrain can be an invaluable asset in the Rebels’ tireless search for any signs of Imperial detection. But their effectiveness stretches far beyond their homeworld. Whether they’re charging through the snow on Hoth or navigating the rocky badlands of Tatooine, these resilient snow lizards—and those who ride them—have something to contribute to any battle. Though they lack the top speed of the T-47 Airspeeders that joined them on Hoth in The Empire Strikes Back, a unit of Tauntaun Riders still moves swiftly using the speed-three movement tool. Even better, because tauntauns aren’t propelled by repulsor engines, their riders have a greater amount of control in the thick of battle. These agile beasts can make pinpoint turns even while crossing more difficult terrain, making it exceptionally hard for enemies to pin them down with blaster fire. Such great speed makes tauntauns ideal for cutting through parts of the battlefield that would bog down other units to gain a superior position. Once there, the troopers riding on the tauntauns can start raining fire on opposing units with their powerful DL-44 Blaster Pistols. These blasters pack a heavy punch, but a tauntaun’s horns and hind claws can be just as effective weapons. In fact, a full-speed charge from a tauntaun can be enough to send even the most hardened Snowtroopers flying. 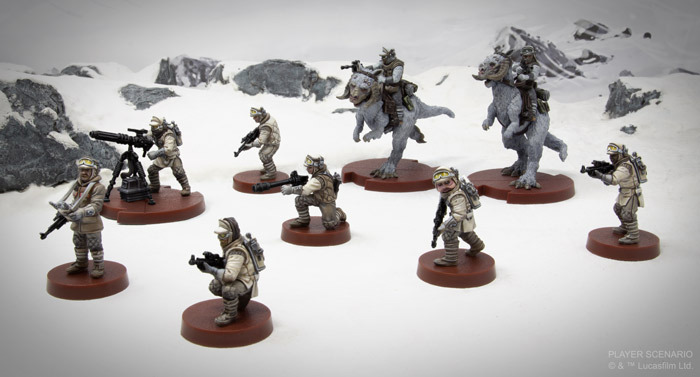 Seeing as they’ll likely be one of your first units to engage with enemy forces, your Tauntaun Riders can be useful far beyond simply attacking. Already trained to be in tune with their rider, with a little extra training your tauntauns can serve a variety of functions within your Rebel army. Whether they’re jamming enemy communications or relaying your orders to units in the middle of a firefight, a tauntaun’s great speed can make it a useful lynchpin in any army’s communication strategy. We’ll explore everything included in the Tauntaun Riders Unit Expansion—including a full look at their upgrade cards—in a future preview! Tauntauns may be native to the ice planet of Hoth, but they can serve the forces of the Rebellion on any planet where they’re needed. 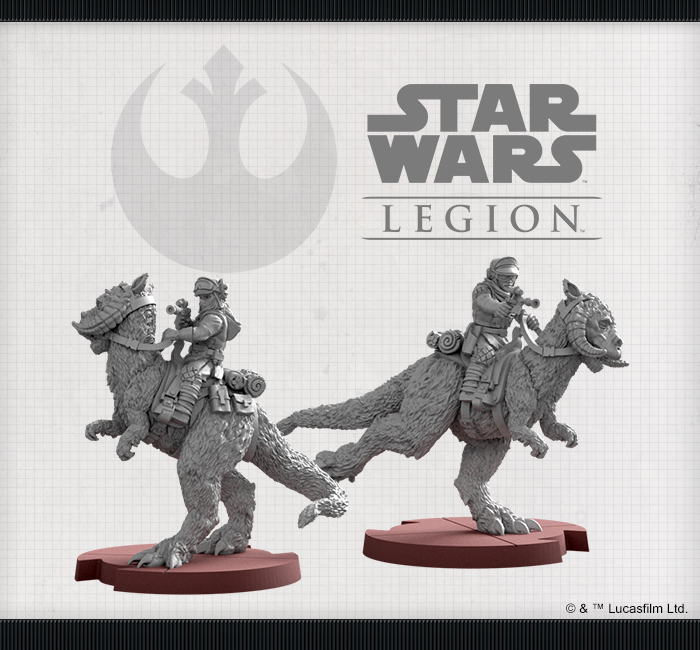 Look for the Tauntaun Riders Unit Expansion (SWL40) and the Rebel Veterans Unit Expansion (SWL39) at your local retailer in the second quarter of 2019. Pre-order your copies at your local retailer or online through our website with free shipping in the continental US here! © & ™ Lucasfilm Ltd. There are currently no Ads to show. Looking for a miniature manufacturer, terrain manufacturer, commissioned painters, skirmish games or board games? Search the Business Directory or select one of the Categories shown below. Is your business not listed? Register and then you can Submit your Entry. Or Contact Us and we'll look into adding it. Website Name, Graphics & Logo Copyright © 2014-2019 Miniature Gaming Guide™. "Miniature Gaming Guide" is a Trademark of Thom Prati. Individual graphics, logos and content are copyright their respective owners.